Did Tom Wilson See Evidence of Autopsy Photo Fakery? Evidence of Autopsy Photo Tampering Housed at the National Archives? Since the photos and x-rays of the JFK assassination autopsy show Kennedy to have been hit from behind by two bullets, conspiracists have adamantly insisted that they have somehow been forged, faked, or tampered with. But what evidence do conspiracists have? Mostly they attack the photographic materials with witness testimony, which supposedly contradicts them. Some conspiracists scrutinize the photos and x-rays closely and claim to find evidence of tampering. But the late Tom Wilson (right) made a much more explosive claim. The following is a message posted by Jack White on an online forum on December 16, 2001. Since learning of Tom's demise, I feel I am no longer held to a promise he asked of me. 1. 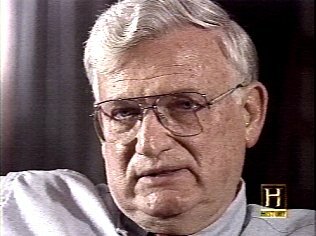 Tom's computer analysis, done with the help of Cyril Wecht, had revealed the fakery of the autopsy. 2. On one of his many trips to the Kennedy Library, he was able to show a video of his computer analysis to a Very Important Person there. 3. That VIP was highly impressed, and provided Tom with a Letter of Introduction to a Very Important Person in the US Senate. 4, That endorsement got Tom an audience with the Senate VIP, who was likewise impressed. 5. The Senate VIP provided Tom with a Letter of Introduction to the Head of the National Archives, requesting that Tom be given UNLIMITED ACCESS to ALL JFK autopsy records. 6. The Archives, after checking the authenticity of the Letter of Introduction, took Tom to a "top secret" area of the archives and handed him several envelopes WHICH HAVE NEVER BEEN SEEN BY JFK RESEARCHERS. 8. According to Tom, these were, in effect, the JOB ENVELOPES retained by the photo retouchers, as one might expect a bureaucratic employee to do. Or were they preserved simply because a patriot REFUSED TO DESTROY THEM? Were they originally intended for destruction? 9. According to Tom, it was OBVIOUS that the Senator decided Tom was a trustworthy person (not a lunatic buff) who could be trusted to DO THE RIGHT THING in bringing this coverup to the public. Tom expected to SUBPOENA these secret photos for trial. Unfortunately, details could have died with Tom. But I doubt it. I believe he must have made arrangements for this secret to survive. He told me many times that he MADE THREE COPIES OF EVERYTHING, which he entrusted to three different persons who did not know each other. Let us hope that they see that Tom's work is carried forward. To say this story lacks plausibility would be an understatement. We are supposed to believe that conspirators faked the autopsy photos and then, instead of destroying the evidence, deposited it in the National Archives. We are also to believe that some "Very Important Person in the US Senate" was told about the materials. So what did he do? Blow the whistle on the conspiracy by revealing the forgery? No, he sat on the information until Tom Wilson showed up at his office. But suppose the senator didn't personally want to "go public" with the information. Why not leak the information to some reputable media outlet which would welcome the scoop of the century? Why not grant access to some high-profile conspiracist like Washington Post writer Jefferson Morley, or Allegheny County Coroner Cyril Wecht, or movie Director Oliver Stone? Then Wilson, armed with his introduction, showed up at the Archives and was shown this explosive material by an obedient archivist. Haven't the people at the Archives been briefed to keep this dangerous stuff secret? But then Wilson, who has gotten this information by the mid-90s, simply sat on it. But was there no basis at all for this story? In response to an inquiry from this writer, Steve Tilley, the person in charge of the JFK materials at the Archives, sent this reply. In June 1995, Mr. Wilson received authorization to the view the Kennedy autopsy materials under the provisions of the deed of gift of October 29, 1966, as set forth Part II, paragraph (2). Mr. Wilson was not authorized to make any reproductions of any autopsy materials. In a letter of August 18, 1995, to Mr. Wilson, I informed him he could bring "...any notes or reproductions of other published material that may be necessary to aid your inspection. Notes may be taken during the inspection but no reproductions of any kind can be made of any autopsy material." Mr. Wilson was also informed that a member of my staff would be present at all times. He was also asked to supply a list any equipment that he planned to bring with him. The equipment used during his examination did not include any reproductive equipment. All autopsy materials as described in Appendix B of the deed of gift were made available to Mr. Wilson on September 25 and September 26, 1995. Mr. Wilson was shown the same materials that have been shown to all individuals or groups authorized to see the autopsy materials. He was not given any special access to these materials. No reproductions of any autopsy materials were made. You can see an image of the letter by clicking here. It seems that, like such witnesses as Roger Craig and Jean Hill, Wilson started with the truth and then went into a wild flight of fancy. He did indeed get access to the autopsy materials. Given that the materials are under the control of the Kennedy family, it's perfectly possible that Senator Teddy Kennedy got him permission to see them. And he was ushered into a "secret room"  at least a room that's not accessible to people who lack special permission to see the autopsy materials. At this point, Wilson and reality part company. Wilson claimed to have made three copies of these materials, which were given to three different people. This is reminiscent of Richard Case Nagell, who claimed to have key documents revealing the nature of the conspiracy. But somehow he was never able to reveal them "now." Rather, they were going to be released after his death. Nagell died in 1995, but no documents have appeared. Neither have any of Wilson's reproductions of autopsy material.